Rhabdomyolysis. I had never heard this word in my life until December 14, 2014. Those who follow football may have heard about the group of Iowa Hawkeyes who went to the hospital with it a few years back after some intense conditioning work. Thanks to Google and an online group of fellow triathletes prodding me to get treatment, I was educated in time. Rhabdo does not have to be dangerous as long as it is treated quickly, but it can be extremely dangerous if ignored for too long. If you are an endurance athlete of any skill level or if you are beginning a training program as many are with the arrival of the New Year, listen up. While rare, this can and does happen to regular people, and you need to know what to do if you see the signs. Group workout night. Offseason circuit training for triathletes. The workout was called the Dirty Dozen, and it was intense, as it was intended to be, and I loved every minute of hating it. It was a good size group, perhaps 20 people of multiple skill levels, and while I’m at best a below average triathlete, I was keeping up. Most of the exercises were very familiar to my body. The anomaly was the pull-ups. Four sets of 12 to be exact. Since I’ve never completed a pull-up in my life to this point, these were assisted. And it was hard. Insanely hard. But again, that’s what I signed up for. I was, I believe, hydrated and fueled appropriately for a one-hour workout. At no point during the workout did I feel any “bad pain”. I know that if this body is going to hold itself together to reach my ultimate half and full Ironman goals, I have to listen to it. It’s a skill I’ve learned the hard way at times, and continue to develop. I left the gym feeling something beyond the customary, satisfying kind of physical drain. My head was cloudy and I had trouble expressing my thoughts to my husband who was thankfully driving. I refueled as quickly as possible, but felt nauseous. At the time, this seemed plausibly “OK”. I had worked hard. Later that night I found my arms so sore I could barely hold my cell phone comfortably. Even something that small felt heavy. Nothing a good night’s sleep couldn’t fix, I thought. I woke feeling sore all over with a particular concentration on my arms, but again I didn’t think it was out of line all things considered. My husband was sore, as were my other fellow triathletes. At work that day I moved a little slowly. My evening workout was an easy recovery swim. 7am spin class. Walking into the Y, my husband bumped into my left arm slightly, which caused an over-the-top “OUCH!” out of me. I spent spin class in my aero bars, which is typical. But the reason I chose that position this time was that my arms were too tired to hold me upright. I chose to skip the second hour of our workout. Strength training was not in the cards for me that day. Throughout the day, my arms felt tighter and tighter. I wasn’t quite sure, but I thought they looked big, almost like I had suddenly gained weight. I could not fully extend them. I was still dismissing this as normal post-workout soreness but hadn’t experienced any swelling like this before. Christmas shopping day with my daughters. Throughout the day, I did not feel pain but the tightness and heaviness in my arms got worse and worse. Carrying bags from the mall felt like carrying weights, and I sensed my shirt was getting tighter. By the time we got home in the evening, I was exhausted. I noticed the size of my arms through my long-sleeved shirt when I looked in the mirror, and I managed to peel the shirt off to find my arms nearly 1.5 times their normal size. Finally, I believed something was wrong. A quick internet search immediately returned information about Rhabdo. You can read more about it here http://www.nlm.nih.gov/medlineplus/ency/article/000473.htm or any number of other places. It is often associated with CrossFit, which is not my sport of choice, so I spent about two hours sitting at home in denial, promising myself I would see the doctor the next morning. My urine was clear and never got to the dark color mentioned online, so I thought this surely couldn’t be what was going on. As the evening wore on, my arms and hands grew larger and I started to feel tingling in my hands. It was time to take this very seriously based on what I was reading. Compartment syndrome is a risk which can require surgery, and kidney damage or failure is possible. I was not prepared to for Santa to bring me a dialysis machine. Off to the ER I went. The diagnosis was Acute Exertional Rhabdomyolysis. During Thursday’s workout, presumably during the pull-ups, I had torn my muscles to such a degree that dangerously high levels of proteins were released into my system. When those proteins travel through to your kidneys, that is what can cause major problems. 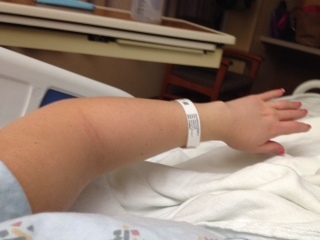 When I arrived at the hospital, my Creatine Kinase (CK) level was 44,000. Normal is somewhere between 100-200. 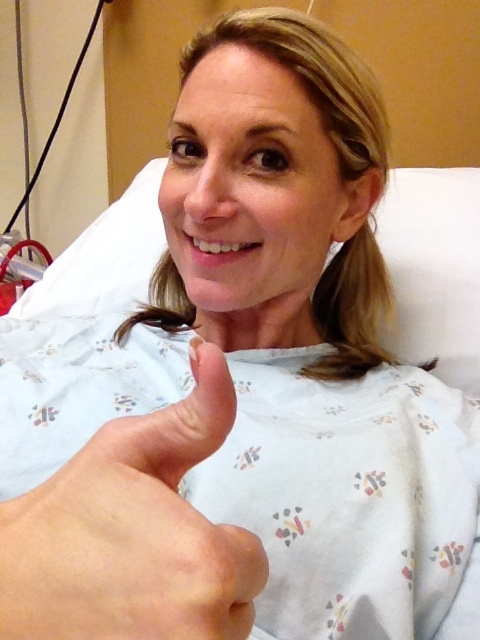 My kidney function was totally normal and I truly felt fine overall. It was hard to believe I was being admitted, but I needed constant IV fluids to protect my kidneys and flush my system out. I really want to emphasize my overall health was excellent through this entire process. 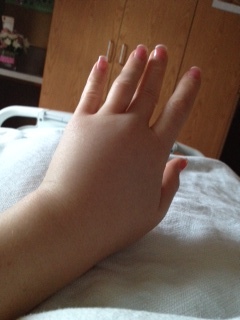 I felt fine and just spent three days of boredom in the hospital. My body is generally very healthy and it knew how to fight off further damage, but most of all I got treatment as quickly as I understood something was really wrong. Admittedly, I almost waited longer. I am grateful I listened to the internal nudge that told me not to wait. You may not be able to prevent something like this from happening to you–I don’t believe I would have done anything differently if I had to do it over–but you absolutely can prevent long-term damage if you take it seriously and get help as soon as you realize something is wrong. CK level was down to 14,000 and I was allowed to go home and continue to hydrate orally to continue the flush. Four days later, a retest showed my CK count was down to 449, and it normalized fully not long thereafter. Immediately after I got home from the hospital and then again the second week after hospitalization I had some really extreme headaches for about three days. A massage helped, but I also needed to replace the electrolytes I had been flushing out with the massive amounts of water I was drinking. A follow up with my family doctor uncovered that the antibiotic Cipro may have made me more susceptible to injury. I was taking Cipro at the time of the workout to treat a urinary tract infection. It is a quinolone and can have negative effects on tendons and muscles. I had no idea this was the case at the time, of course. I was released to ease back into training last Monday, December 29. It will be awhile before my arms are ready for work. My left arm still feels achy and tires easily, so it needs more time. My ultimate goals haven’t been changed by this experience, but I certainly will change my approach to strength training, and I’m not sure I ever need to do a pull-up again! I can still cross that IM finish without them. Safe, Happy Training to you all in the New Year! My God, you’ve been through a lot this year. Let me know if there is anything we can do, and here’s hoping 2015 is a healthier year for you.